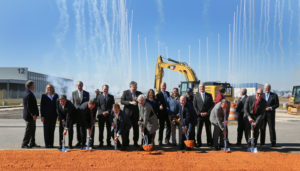 The first shovelfuls of dirt went flying at the new Airbus Final Assembly Line in Mobile Wednesday morning, followed by a surprise show of fireworks — all celebrating that when the new A220 line gears up, Mobile will be the fourth largest producer of commercial aircraft in the world. Right now it’s rolling out more than four a month of the aircraft company’s A320 family, on the way to producing five a month. When the new Final Assembly Line is at full production, turning out another four a month, Mobile will move into the world’s fourth ranking. Only Toulouse, France, and Hamburg, Germany — both Airbus facilities — and Seattle, home of commercial rival Boeing, produce more. The groundbreaking was an Airbus special — balloons and crowds and speeches and local dignitaries, airline company officials, Airbus leaders from much of the company’s global footprint, employees, construction team members, and several dozen journalists from key air and business publications all over Europe and North America. There were serious questions during media session. How will Brexit affect Airbus’ ability to complete planes on time? What kind of incentives did the company win from state and local authorities? How is Airbus going after the U.S. Air Force tanker contract this time? What’s the actual demand for the new A220? And there were serious answers. Airbus is hoping Britain can still avoid an economically disastrous split from the European Union, but is developing contingency plans. The wing, crucial to any aircraft design, is currently built in Britain. Incentives? Ask the local and state officials, Airbus officials deferred. The tanker contract? Yes, Airbus is trying again after losing to Boeing. “I still don’t understand why the most powerful Air Force in the world wouldn’t fly the best tanker,” said Airbus CEO Tom Enders, noting that his firm has won contracts from virtually all other major world air forces. Demand? Airbus has an order book of more than 500 of the new 100- to 150-seat single-aisle craft, and Delta, the company whose order prompted Airbus to take on the Canadian plane and bring production to the U.S., has “topped up” its order, said Jeff Knittel, chairman and CEO of Airbus Americas. But the event was first and foremost a celebration of Airbus in Alabama. And, said Enders, while the company enjoys its special relationship with Mobile and Alabama, it’s not here because the people are nice but because the U.S. is the largest market in the world for single-aisle commercial aircraft and it makes sense to bring the production to the market.